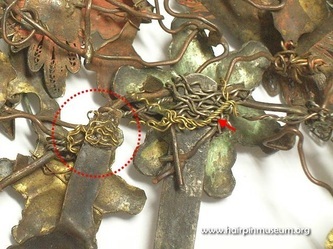 People often try to repair their old hairpins to get better price if they decide to sell them. It may work for the seller (a higher price) but afterwards it can be a big problem for the hairpin. 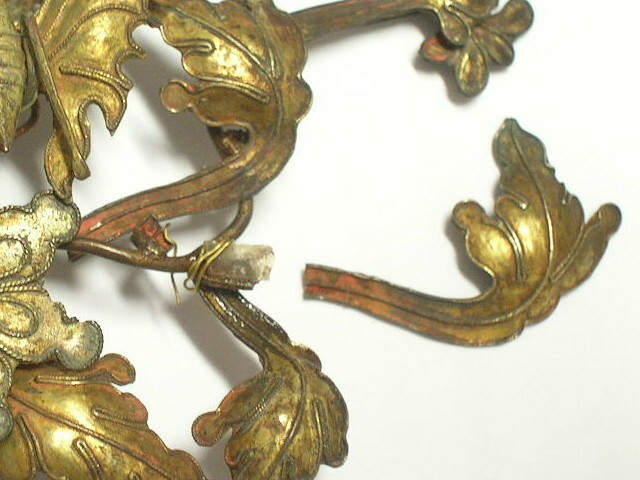 Professional conservators use special, scientifically tested adhesives that are easily reversible (e.g. Paraloid/Acryloid B-72 or B-48N). 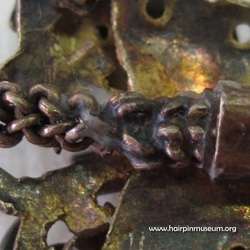 The wrong kind of glue can go deep into the fine details of the hairpins and be impossible to remove later. So, even if the hairpin is incorrectly stuck together, or if the glue runs where it is not needed, it can be impossible or very difficult to remove. If the glue shrinks with time it can also peel the gilt from the surface of the hairpin. Here, super glue (an instant cyanoacrylate adhesive) has been used to glue the pin back onto an intricately detailed butterfly hairpin. It was easy to put the glue on, but is very difficult to remove. The glue has run deep into the chain-like details. Using the wrong kind of glue is not only ugly but can become unstable with time and damage the hairpins. Under UV light glue is very obvious. 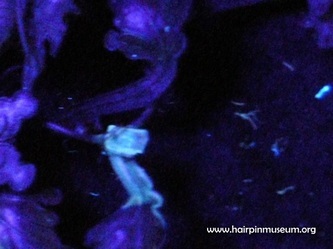 Conservators often use UV light to detect traces of organic material - just like the detectives in CSI! The pictures below are from a hairpin that was badly repaired by non-professionals. They tried to glue the broken part of the leaf on this hairpin but the joint failed and the leaf fell off again, leaving the glue residue behind. The pictures on the left hand side show the hairpin under the normal (visible) light. 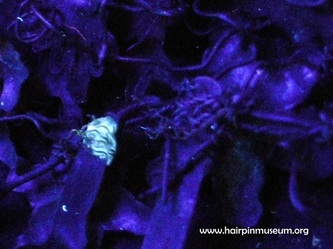 On the right hand side are pictures are taken under UV light. Under UV the glue glows (fluoresces) bright blue. It is very obvious where the glue is, including splashes of excess glue.